For this hop we will be featuring the letter "D". This may be the name of a paper, a stamp set or an embellishment. Whatever the crafter has chosen as their "D" element will be featured in their post. If you came from "Cary Magnani - My Heart's Design" then you're on the right track! The letter "D" represent Dimensional Elements. My sister friend Candi O was telling me she wanted to know more about how to use these chipboard pieces that come with our AMAZING cricut cartridges. You can also purchase them separately!! 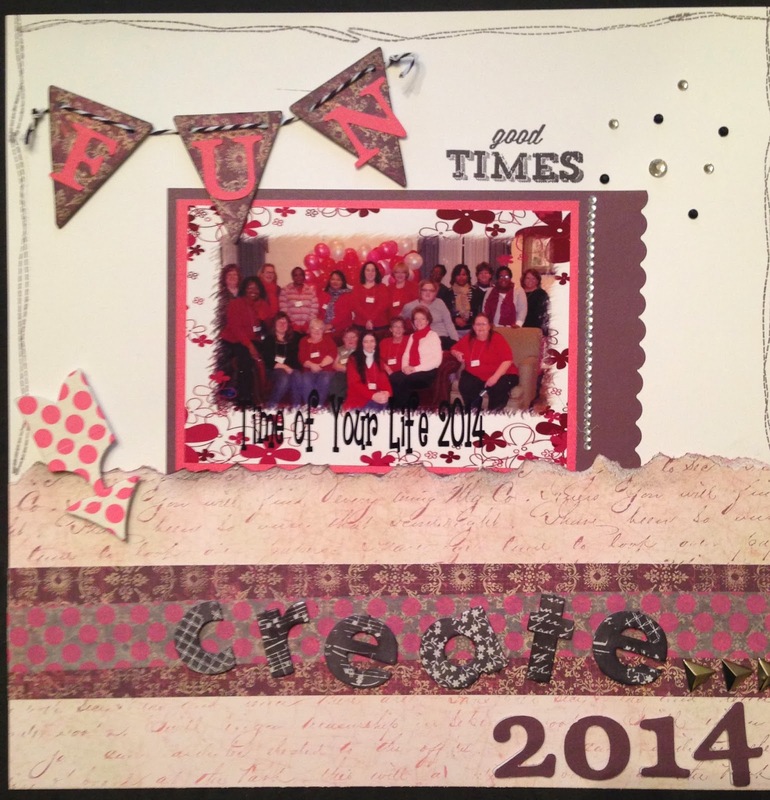 I put together this cool layout using our group picture from a scrapbooking retreat last weekend. The new Ivy Lane paper packet was my paper of choice. I used Smokey Plum and black ink. I decided I would use dimensional elements on the layout to show 3 different ways to have fun with this chipboard. Here is a video of me putting on the final touches of this page. Cover the chipboard with paper. That is right you can cut out the images using the appropriate cricut cart and adhere the paper onto the chipboard with your adhesive. The possibilities are endless with all the different pattern papers that exist. I did this with the "2014" chipboard as well as the 3 banners. I cut the shapes from the Art Philosophy cricut cart. Ink the chipboard. You can ink it to match the papers and card stock used on your pages or cards. In this layout I inked the Irresistible which is chipboard with resistible patterns on them. When you add the ink you will see the resistible image appear. Cover it with washi tape. I adore this polka dot washi tape!! I literally cut strips and placed it over the chipboard. I cut off the excess and smoothed down the edges. I really like how it came out!! Here is some up close and personal pics of the dimensional elements in action!! I used Black Bakers Twine, Durable Triangle Studs(antiqued silver) and Sparkles Black and Gray Assortment. I used the Stitched Together and Artbooking cricut cart stamp set for the term "good times". I am slso using this layout for the SOC "It's s Bling Thing" Challenge...having some fun putting a little bling on my page. You can't go wrong with itty bitty sparkles. 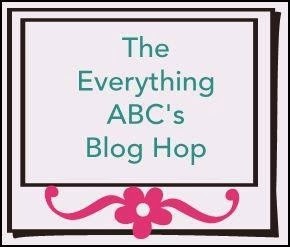 Your next stop on our Everything ABC'S blog Hop is "Pam Trostle - Pam's Crafty Creations" blog. I am camping at present - look forward tot hat video when I get home! I love the look of your page. love the wash tape on dimensionals idea! Cute layout and fun with all the dimension and texture! I love what you did. Washi tape is so fun. I love your scrapbook page. So beautiful! Covering the shapes with washi tape is genius! And I love those Irresistables and how they turned out! Thanks so much for your tips and tutorial! That smokey plum is such a gorgeous colour- and I love your banner! Awesome video - thank you for all these ideas! What a great layout! And all your details in the blog post & on your video on using the Dimensional Elements are great!! It's nice to see I'm not the only one that can lose something I'm working on when it is right in front of me ;o) I really need to pull out my DE's & use them more often! Thanks for the ideas! Pam I had numbers and papers flying everywhere!! lol Then I noticed I said 2004 instead of 2014..what a video!! Thank you for your compliments!! Nice job on this Shalana. I really like how you used all of the different patterns together with the dimensional elements to create your page. I have yet to use my dimensional elements and I have many! You have inspired me! You aren't alone. A lot of my scrappy friends have them and they always so I just don't know what to do with them. I was hoping this via would inspire them to use them up!! Love the finished layout but I am a bit confused as to why it was all backward in the video even when you picked it up to show us. Hi Robyn - At time I use my laptop to video until I get another means to do so and it makes everything look backwards. Hopefully I will be able to get a new way to video soon. Awesome use of the chipboard elements Shalana! Love your layout!